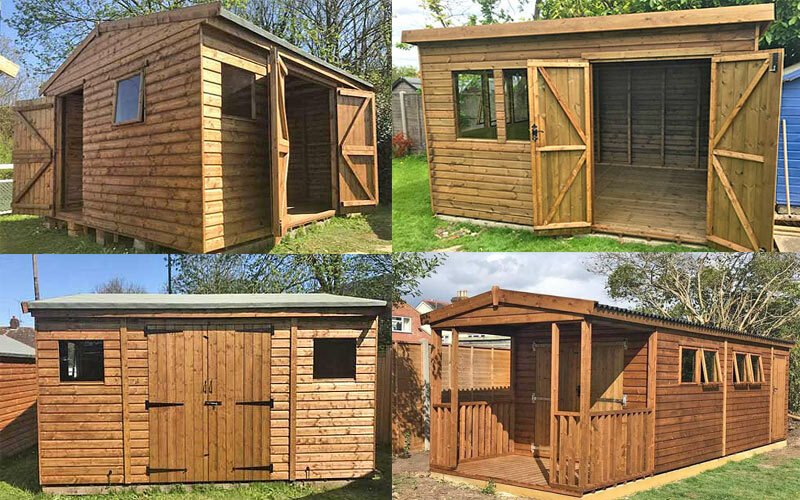 We are a family run business that specializes in manufacturing and installing high quality bespoke hand-made garden sheds as well as offering a large range of timber and fencing products. Our manufacture and shop base is located in Crowborough, East Sussex, this is where our team of dedicated craftsmen create a wide range of models in all shapes, sizes and price ranges, each one practical, durable and attractive. With over 25 years experience, we pride ourselves in offering our customers the highest quality tanalised garden buildings, sheds, sectional sheds, workshops, children's play houses, summer houses, mini sheds, animal and equestrian housing. We also offer a first class made-to-measure design service, as we manufacture in-house. You are not limited to sizes, shapes or specifications. Send us your file or sketch to receive a free no obligation quotation. A range of quality garden sheds and garden buildings including apex sheds and pent sheds made from T&G shiplap or loglap timber. If a 'normal' timber shed doesn't quite fit the bill then how about a heavy duty timber building custom built to your own specification. And for the DIY enthusiast to the professional carpenter we offer a large selection of timber and fencing products. A popular choice within our garden shed and garden building range is the summerhouse shed type. Design your own garden building and send your sketch to us for a personalised quotation. Looking to turn your garden patio area into something special, try our decking boards, wood deck panels and treated timber decking.